My husband has been a big supporter of my French Fridays with Dorie adventures. He loves to eat and is generally very open to different foods. He has gamely tried every single recipe I have made and lent a hand in the kitchen on more than one occasion. This project has reminded me just how lucky I am to have found a man who isn’t a stereotypical meat-n-potatoes-only type. In fact, just two weeks ago, as he was scarfing down the sardine rillettes, I had to smile and say a silent little thank you to cupid. the German: What are we cooking this month? me: Um, let’s see, the first recipe is asparagus with bits of bacon. the German: That sounds good, what else? me: Next comes sardine rillettes. the German: What’s a rillette? me: It’s a spread made with meat, but we’re making it with sardines. the German: Interesting, what else? me: Coconut friands, I think it’s a kind of cookie made with coconut. the German: Sounds weird, what else? me: Navarin Printanier, it’s a lamb stew. the German: Finally some real food! And there you have it. He might not be a meat-n-potatoes-only type, but he certainly is a meat-n-potatoes-preferred type. But, moving on. Did anyone else notice that there were no pictures in the book for any of this month’s recipes? What’s up with that? I like pictures. It gives me a visual goal to aim for. Thank goodness for google, which gave me a variety of pictures to chose from, all clearly painting the picture that this week’s French Fridays with Dorie recipe, Navarin Printanier, is a lamb stew. To be specific, lamb stew made with spring vegetables. Does spring stew sound weird to anyone else? Isn’t stew supposed to be winter fare? Am I the only one? Well, I was the only one in my house because my husband loved this dish. The lamb was tender, the veggies were flavorful, and even I was impresses by how tasty the sauce was. He was thrilled to finally get a little “real food” and I thought it was probably the best lamb stew I had ever eaten. Which is as high a compliment as stew can get from me. Especially in April. This entry was posted in french fridays with dorie and tagged Around my French Table, lamb, main course, seasonal - spring. Bookmark the permalink. I didn’t find spring stew too weird, since it is still pretty chilly up here; but, I definitely would not want to be making this at the end of May! Your stew looks lovely & glad you found one that was a winner. Haha! You and I are stew-sisters, Rose. I also thought this dish was meant for the dead of winter. Were the vegetables even springy? I mean, I know it SAYS that, but I don’t think of turnips and potatoes and carrots as Spring food. Oh well. It tasted good, but the weather was way too warm to eat much of it. I think the point was that it was supposed to be made with spring versions of winter vegetables, like new potatoes instead of mature potatoes and pearl onions instead of regular onions. But it still seemed like winter fare to me. Either way though, I agree with you that I like lamb stew better than beef stew. I noticed the lack of photos, too! Since our weather has gotten very cold this week this recipe worked quite well. Your stew looks wonderfully delicious…glad your husband enjoyed the real food! Have a wonderful weekend! 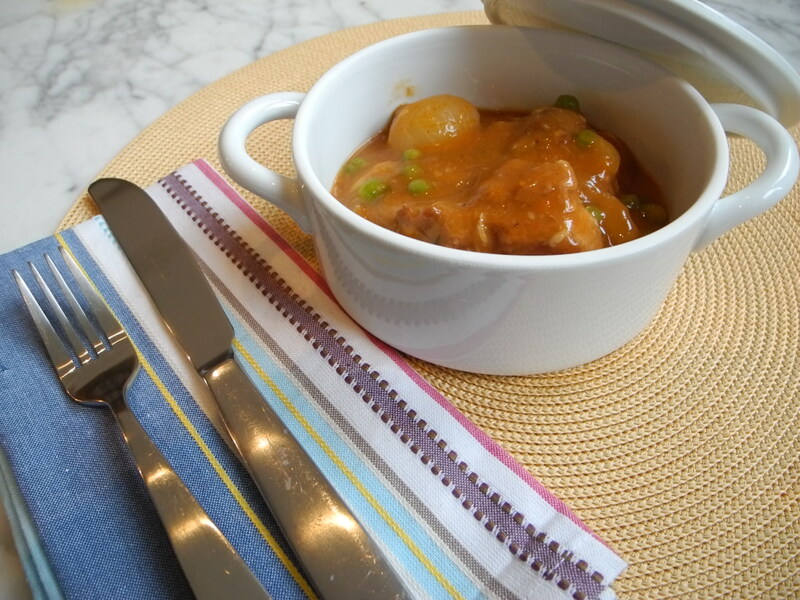 Lovely photo of your lamb stew in the cute white porcelain casserole dish – looks delicious! So glad you and your husband enjoyed this stew. And since the weather is not much like springtime right now (we even had two hailstorms last week), this stew seems to have been just the right dish to prepare. Nice post. Have a great weekend! FINALLY, a sane person who realizes lamb stew is a winter dish. I used that thought as my opening paragraph. BUT, since it was this week’s recipe, I swallowed that idea and went with lamb springtime stew. Yes, April and the chosen recipes have been a bit of a struggle but I was happy with everything but the sardine rillettes. Couldn’t do it. Went the tuna route. Anyway, I’m glad you finally gave your husband reallllllll food. He sounds like a great guy. Yes – it seemed like winter stew to me…my daughter asked where in France it was cool enough for this recipe at this time of year! It is certainly too hot for it in Central Texas. Like your covered bowl! My husband is really happy when he tries the yummy food too. We were just laughing about our old stand-bys and wondered if they were a thing of the past! My husband is pretty much a meat and potatoes guy so you’re a lucky duck! Looking at your thick sauce, I went back to the recipe and realized that I only used one tablespoon of flour instead of three! Whoopsie! Your stew looks delicious! At least your husband eats the carbs. I have to pretty much eat everything that has carbohydrates in it. Or get my kids to eat it, or my mother-in-law. Or the neighbors. See where i am going here? Lucky, you, indeed. Men mostly are meat eaters 🙂 that goes for my hubby and he loves it. I really have to thank Dorie for sharing such a delicious classic stew. Love the veggies that absorbed in the flavorful soup. A keeper for sure:) Have a nice day! I totally agree with you about this not being very springlike. It’s way too early where I live to have spring versions of any of these ROOT vegetables. In any case, the flavors certainly reminded me of cold weather. Good thing it was a cool week. Funny observation about the lack of photos for this month’s choices. When there isn’t a picture, I know that it won’t be the most attractive dish to photograph. Editors do know what they’re doing. In any case, I thought this was delicious regardless of the questionable seasonality. Good looking stew! I have a hubby who isn’t afraid to try new stuff and I am so glad! Yours looks really yummy. I should start Google searching the recipes for pictures like you’re doing. Although it does make it interesting, cooking but not knowing what you’re aiming for! That conversation pretty much sums up my husband too! Supportive and willing to try anything. But he loves his meat and considers it “real food” too! Very cute post, Rose. I also thank my lucky stars for my husband who is also a big supporter of my cooking and baking groups. Luckily it cooled down a bit this week, otherwise, I would not have wanted to cook stew, but we do often eat lamb especially during the spring months. Your photo is just lovely! Finally some real food indeed! Lol. That made me laugh but I hear that ALL THE TIME! Cute post! Today I mentioned to my hubby that I had missed this weeks dish and had to post last week’s sardines instead. He asked what I had skipped and when I told him he was very frustrated that THIS was the dish I decided to skip. lol. So I’m making it today to keep the peace. I noticed the “no photos” thing myself. I wonder why. I’m glad your husband is open to taste-testing! I loved this one too – it was so tasty. Glad you and your hubby enjoyed it. LOL, I don’t know that I would have said “real food” but it wasnt a side dish or appetizer thats for sure! I was the most excited about this recipe at the end of the month 🙂 Glad you both enjoyed it as much as us! I like pictures, too, and had I not been rushing around these past 2 weeks trying to actually cook the recipes, I might have noticed there were no pictures! My husband is like yours–open to try any food. Your ‘fare’ looks yummy. It’s been unseasonable cold here in Southern CA, so the stew made for perfect comfort food. My husband is super-supportive, too! I occasionally skip a recipe that neither one of us is keen on (like the Sardines! ), but we’ve been surprised by many of them! I enjoy hearing the various reactions the husbands have. Mine is pretty game for most of it, but there are definitely things he likes better than others. Glad to hear your husband loved this one! This is one of the best stews I have had too. Funny story. I’m really lucky – my husband will eat almost anything – but he is happiest when I’m serving him meat and potatoes. I didn’t make this one, but glad to hear you liked it (at least for stew in April…).